The CADWELD process is a method of making welded electrical connections of aluminum to aluminum, copper to copper, and copper to steel in which no external sources of heat, such as electricity or gas, are required. 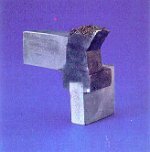 Close handles to lock mold halves together.Drop the metal disk into crucible, ensuring it is correctly seated and covering the tap hole. Close the cover. Ignite with spark from flint ignitor.NOTE: DO NOT use a torch or matches. Visually inspect the connection to make sure it is good. NOTE: The above information is a guide only. The detailed instructions and safety precautions provided with each mold should be read prior to making a CADWELD connection. With the increasing costs of electric power today, the need for reliable and efficient electrical connections is more critical than ever. ERICO responds with an industry-wise engineering and sales support group. Engineered designs of specific applications, especially large and complex welds, are thoroughly tested. ERICO performs a wide variety of testing. In-house testing capabilities and outside facilities are used to assure connection performance and reliability.